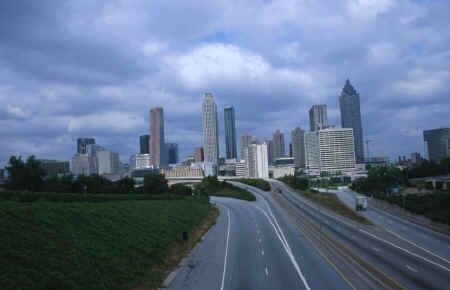 Research by NASA scientists, the University of Georgia, American Forests and others shows that the 13-county metro Atlanta area lost about 190,000 acres of tree canopy from 1988 to 1998 (about 50 acres per day). As a result, metropolitan urban heat islands are growing larger and hotter, reaching as much as 12 degrees F hotter than surrounding countryside. Trees and other vegetation not only cool ambient air temperature through evapotranspiration, they also slow the movement of stormwater, lower total runoff volume, reduce flooding and control erosion. A single properly watered tree can "evapotranspirate" 40 gallons of water in a day - offsetting the heat equivalent to that produced by one hundred 100-watt lamps burning eight hours per day. By providing cooling shade, strategically placed trees around buildings and parking lots can reduce energy costs for cooling and mitigate the impact of heat absorbing parking lots, not to mention the aesthetic benefits provided to the urban streets.